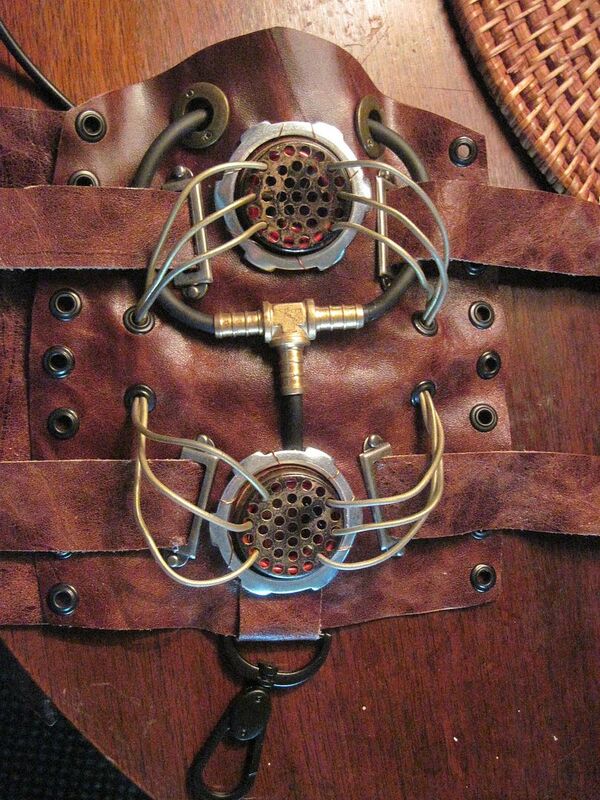 For my birthday present Jon is taking me to an Abney Park concert. This will be my fifth AP concert, but my first since Nathaniael Johnstone left the band and a couple new people joined. I'm eager to see how the new members perform! 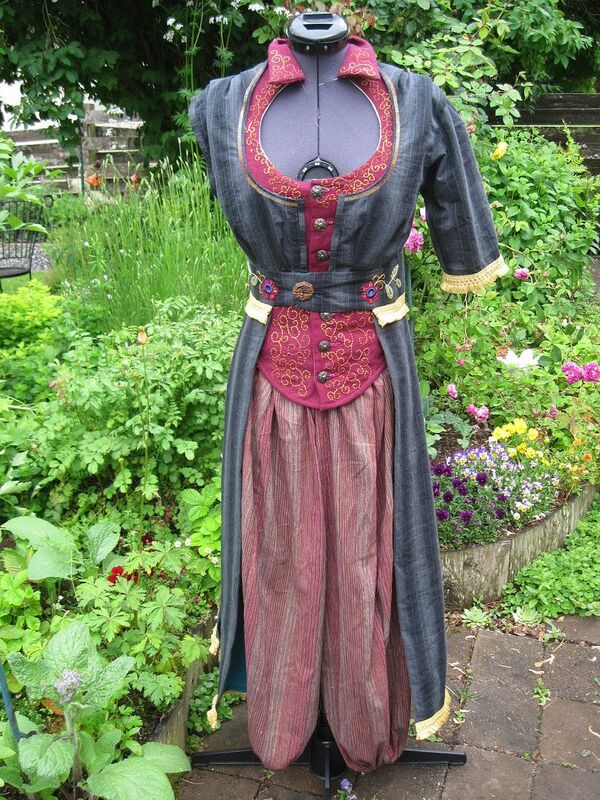 Since each AP concert calls for a new steampunk outfit to wear, this time it seemed a perfect fit to do a NeoBedouin costume. Captain Robert (lead singer and lyric-writer) recently published his first novel, a fictionalized account of the band's adventures in the past and future. In his fictional world, there are people in the future who have abandoned life in the cities for a life of freedom. He calls them "NeoBedouins" and has a few descriptions of how they dress. 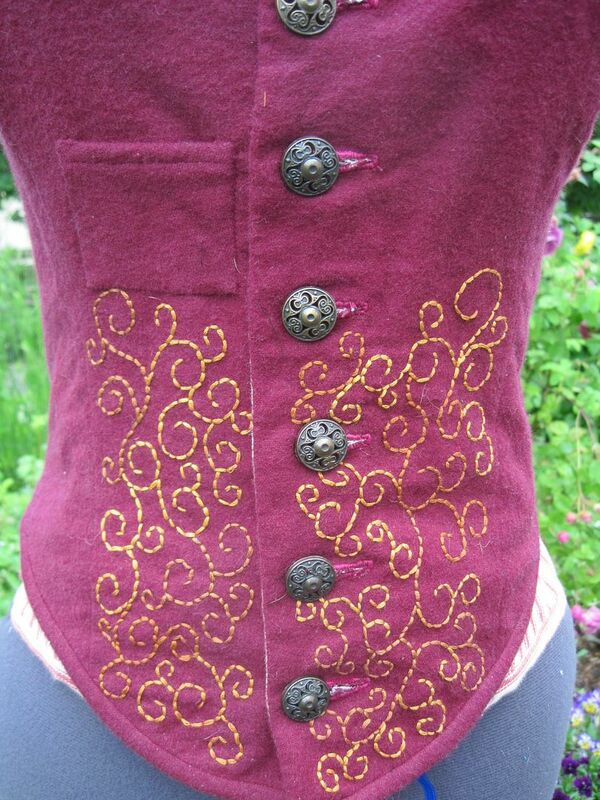 Wool and leather vests, with ornate embroidery. Baggy pants tucked into enormous boots. Headdresses of made of belts and odd pieces of machinery. Basically, in Robert's world, technology exists and is used - but outside of the cities, mankind is reduced to a more natural/primal state as well, with attacks from wild beasts common, and people foraging or trading for what they need. These NeoBedouins are not a particular race, but anyone who has chosen this lifestyle. I took that, and I ran with it. I loved the idea of the tech combined with the primal. A group/race of people who live in such close proximity to dangerous wild animals, would use parts of the animals in their dress. Fur, skin, teeth and claws....if only to demonstrate that they survived an attack. But since they also trade or scavenge for their needs, they would have cast-offs from the city. Fancy fabrics and bits of jewelry or "odd bits of machinery". Something that might be too worn or impractical for a their outside lives would be torn apart and modified into something new. 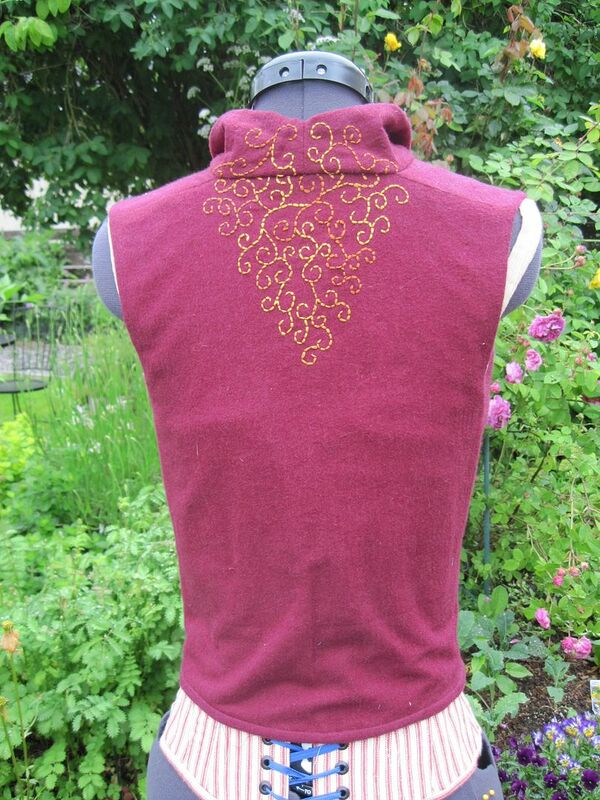 One wool vest, with embroidery. I went with a MIddle Eastern-inspired coat, instead of a cloak. It seemed more...right, to me. Yes, there is only one sleeve. I'll tell you the reason for that at the end! 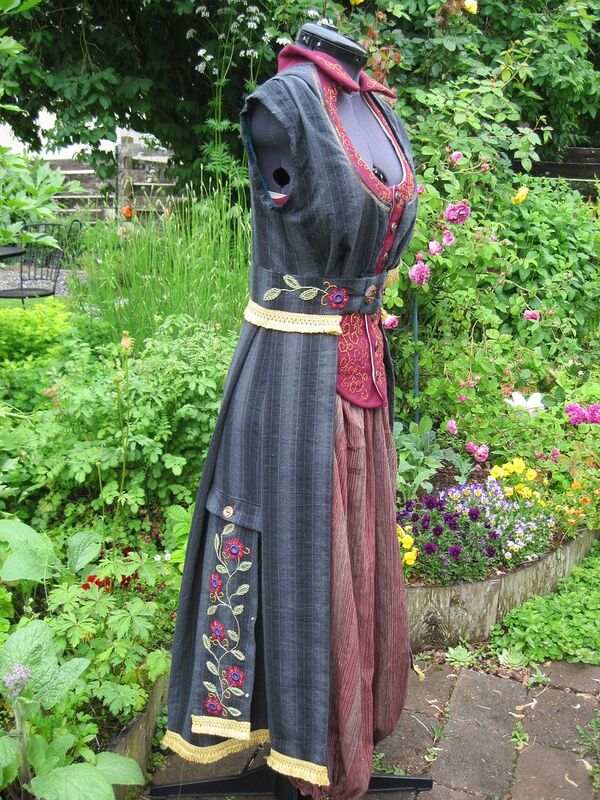 For the embroidery, I went with a sort of almost Scandinavian look, because I wanted to pull it away from a complete "Middle Eastern" look. I wanted it to look not completely racially homogeneous, but more like the outcasts from a city were jumbled together, and their styles started to merge as they borrowed designs and ideas off each other. 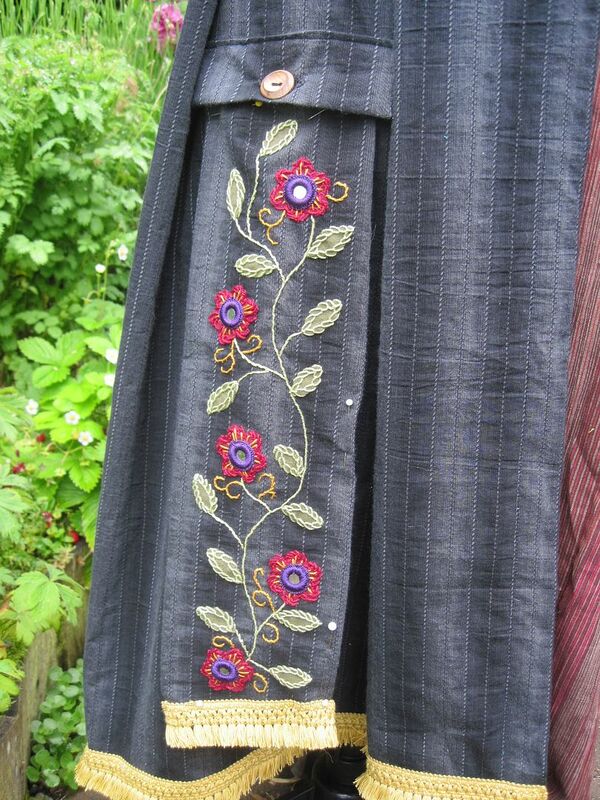 The center of the flowers are tiny mirrors - totally NOT a Scandinavian style of embroidery! These embroidered panels on the sides hang underneath pockets, and I think they will have some sort of secret/fun pocket on their undersides. Possibly a place to hide a weapon? 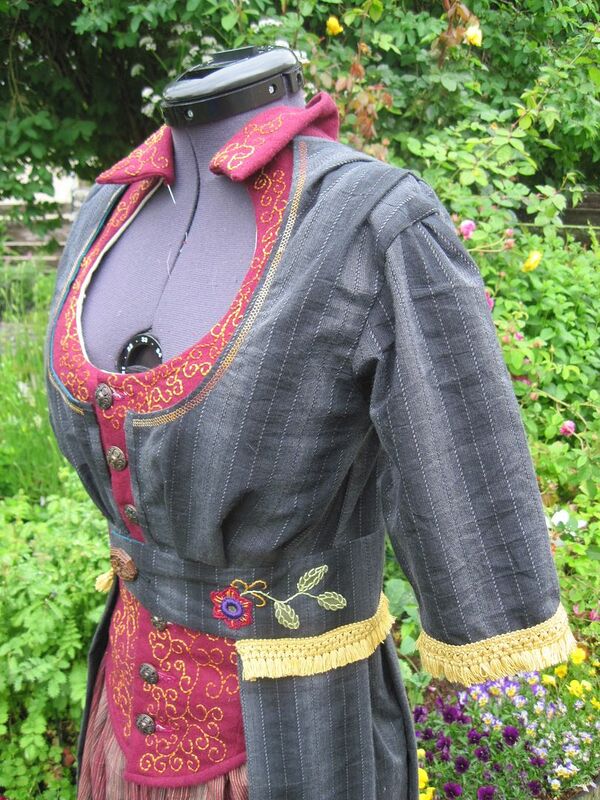 The back of the coat is split, to enable riding on a motorbike or camel. 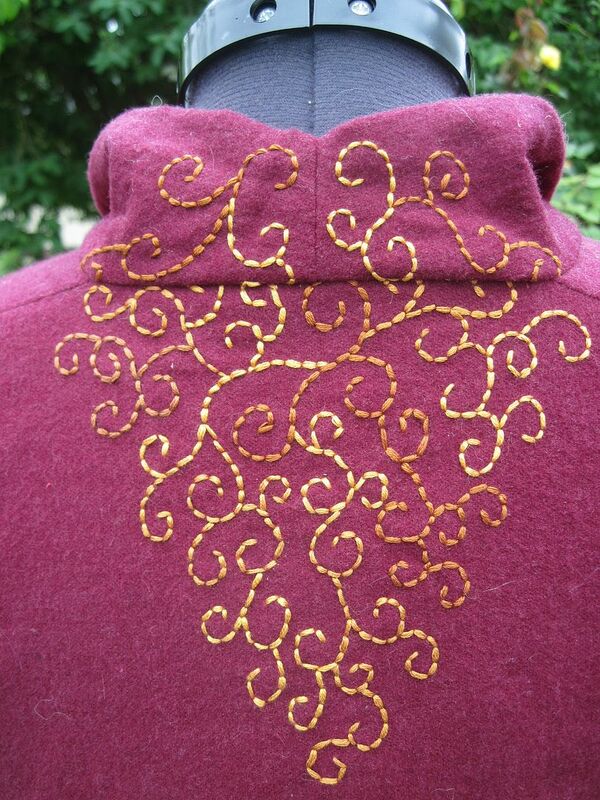 I also cut the back of the neck down, to show off the embroidery on the vest. 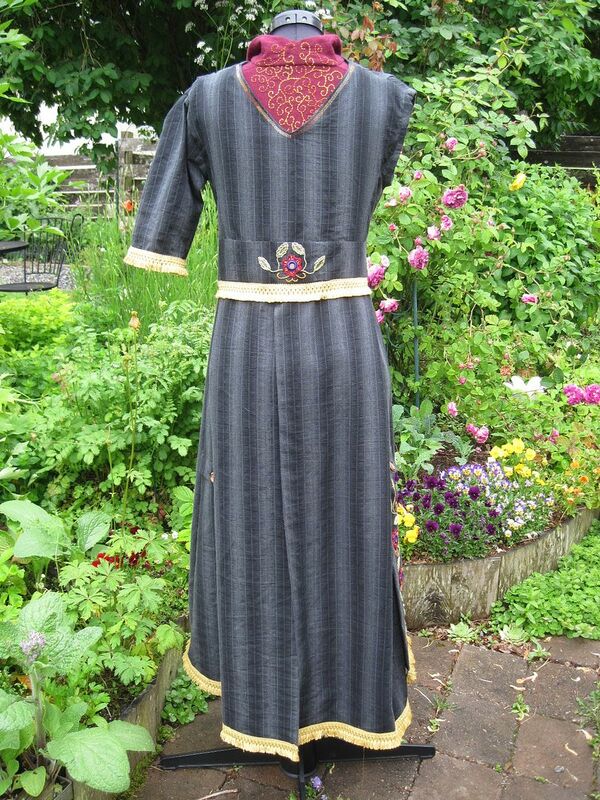 I think I'll put some sort of fur trim on the shoulders of this. 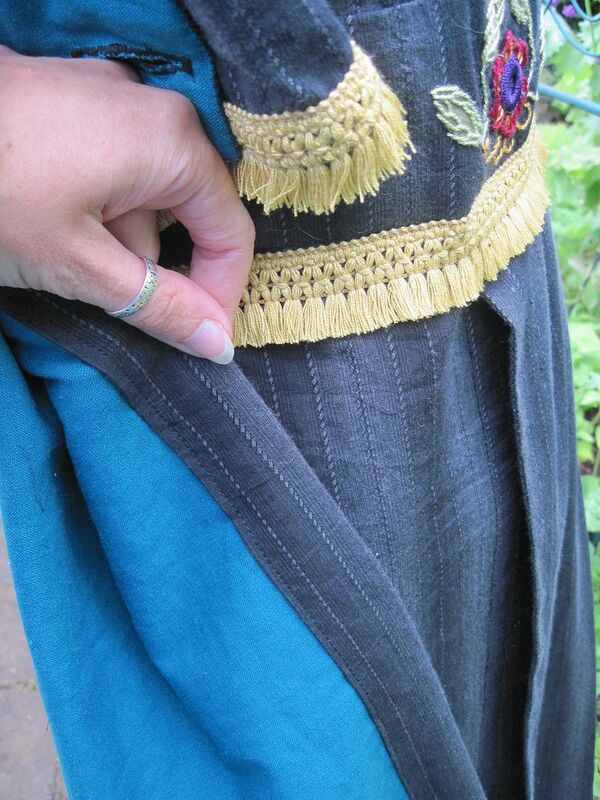 The inside of the coat is lined in bright turquoise fabric. This will show in flashes of color when I walk. It matches nothing else on the costume, but I like that. When you're trading/scavenging for fabric, you can't always find those exact color matches! 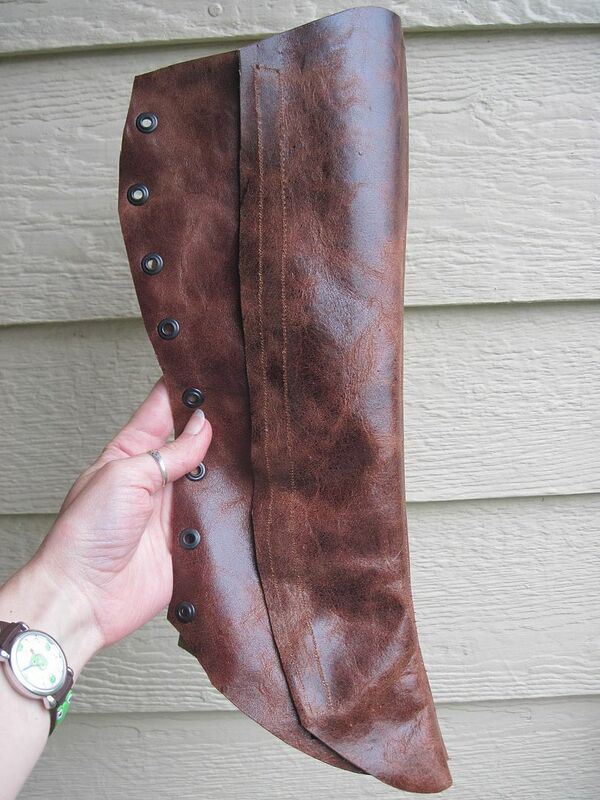 For boots, I'm making a pair of leather spats. This is my first time sewing with genuine leather, and I'm loving it. I bought leather needles for my machine, and it's as easy to work with as any fabric. There will be buckles, I think, and possibly fur. Or some other kind of decoration. And now...the reason for there being only one sleeve on the coat. These people are fighers. Stands to reason they would have some sort of armor. 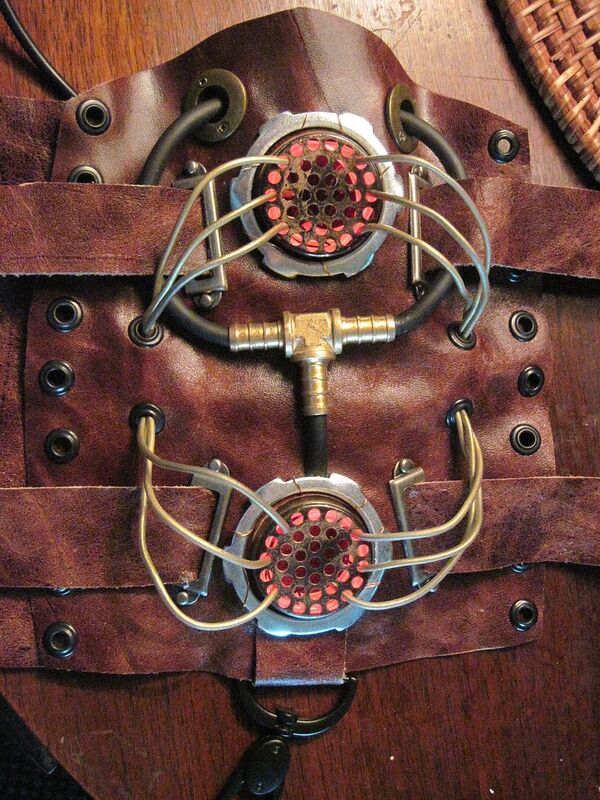 On my "sword arm" I've taken off the sleeve (which would only get shredded by a leopard, should I be fighting one off) and am making a steampunk leather arm protector thing. Cool name/function still to be determined. This will wrap around my upper arm, and lace and buckle in place. And yes! It lights up!!! In the pic below, it's "full on" (and not very bright because of the camera's lighting needs.) I can also make it flicker, which I think is the coolest effect. In dim lighting, it's awesome. I used EL wire that came in about a two foot length. It's powered by a small battery pack. I coiled it underneath the painted drain stoppers. Once it's finished, I'll get a video for you guys...in dim light. So there it is, so far. Just wait until you see what I have planned for my head!!!! Can't wait to see it ON!!! looks amazing!!! Love, love, love, love, love! I can't want to see the modeled pics. I ADORE this outfit so far. You make me wish I could embroider. The vest is fantastic and the armor piece looks great so far. I've heard EL wire is very fragile, so interested in how it works for you. 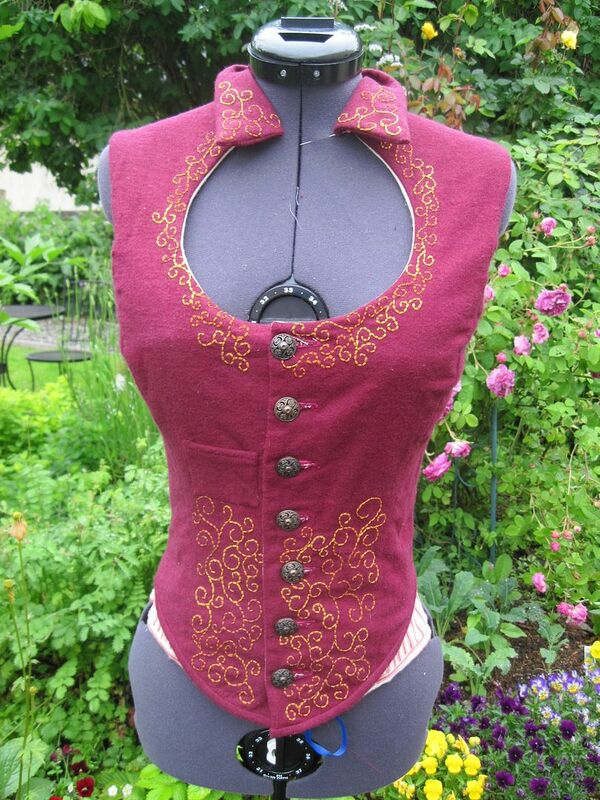 I can already tell this is going to be one of my favorite steampunk costumes when it's done! Dude. DUDE. I will pay you CASH MONEY for that vest pattern!!!! Must. Have. All. Thecollaredpatterns!!!! 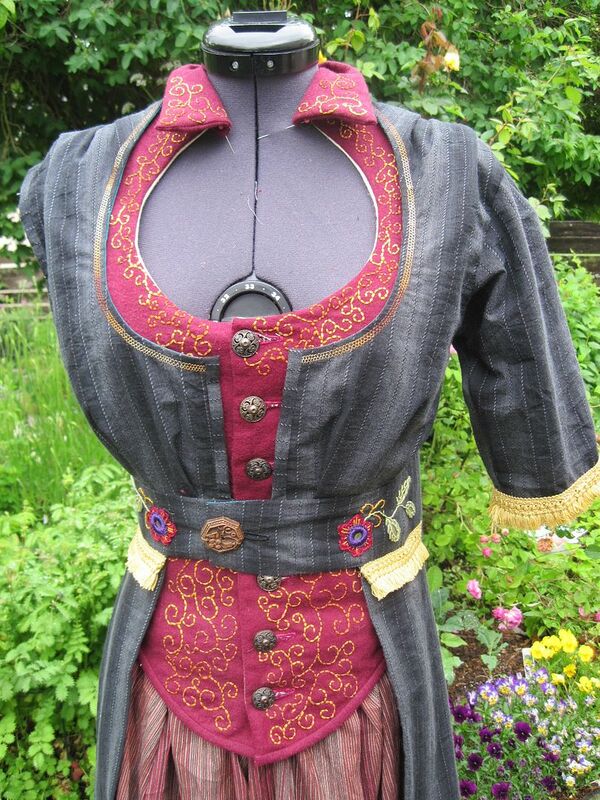 I am totally in love with you now, this is steam punk done right!